Of course, just as the produce department is beginning to burst with signs of spring–ramps! non-droopy cilantro! 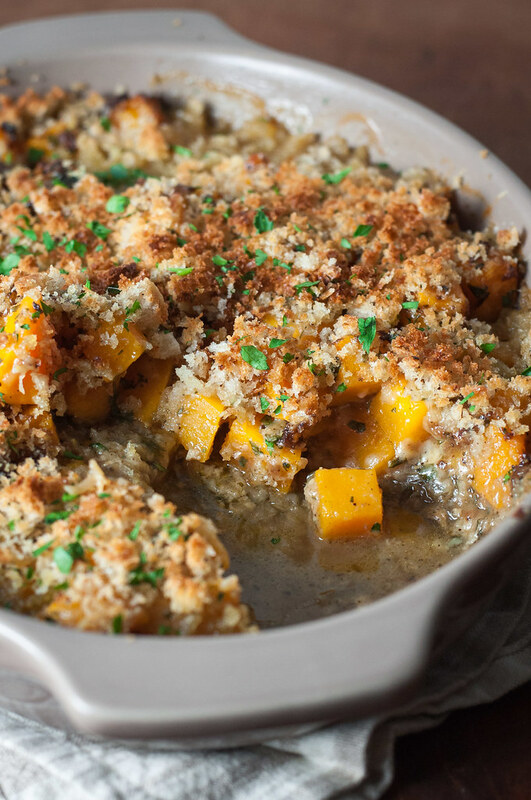 locally-grown greens!–I’m making a hearty, comforting butternut squash gratin. As I work my way through the Gratin chapter of The New Vegetarian Cooking for Everyone, though, I don’t have a whole lot of options to choose from. I’ve made 17 of 26 gratins, almost all successfully, and the remaining recipes contain a lot of summer produce, so I’m trying to pick and choose until tomatoes and corn-on-the-cob are at their peak later this summer. In just over a week I’ll be heading up to The Hickories, a nearby farm whose CSA program I belong to this year. They’re hosting a meet and greet for CSA members, so my sister is going to join me for a picnic dinner on the farm, an intro to picking up CSA shares (involving some pick-your-own options every week), a tour to see how the current crops are coming up, and, undoubtedly, some shopping in The Hickories’ extensive farm store. I’m looking forward to starting the pickups and seeing those “odd” veggies that I happen to have a use for, given my gratin cook-through “challenge.” For the first time ever, I’m going to be ecstatic to see kohlrabi, so I can return to the second gratin in the chapter: kohlrabi gratin with blue cheese. Yum! 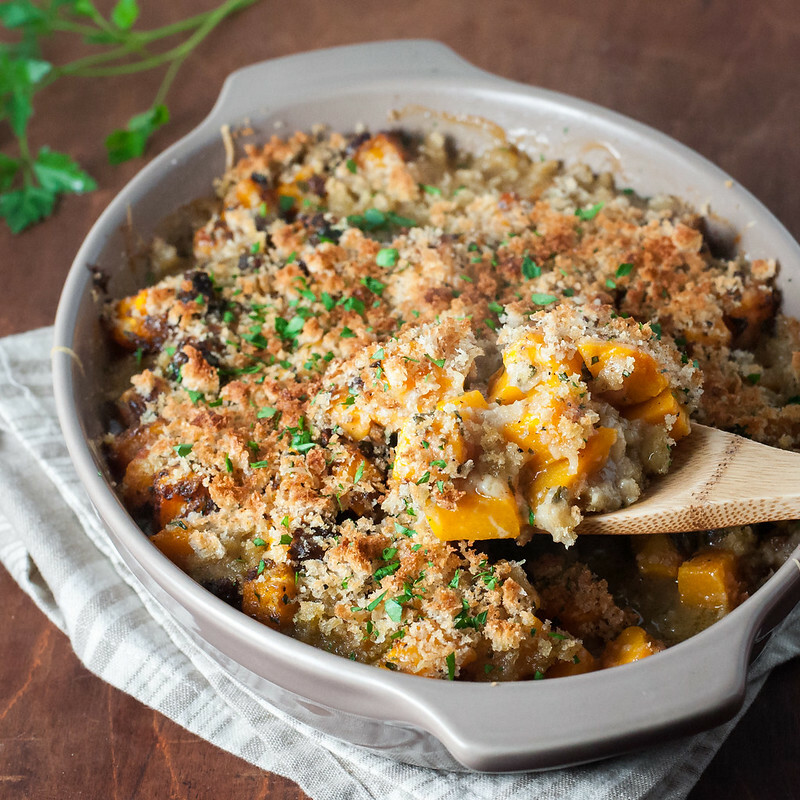 In the meantime, if you’re not on a constant rotation of salads and grilling yet, and assuming your A/C is running, and that you can still find decent looking butternut or other winter squash, this butternut squash gratin is cheesy, hearty, and satisfying anytime. The top layer of bread crumbs binds with the gruyere just beneath it and reminds me of stuffing, which–who doesn’t like that??? To make the flavor a bit more summer-y, try omitting the thyme and sage and mixing extra minced fresh parsley into the onions after they’re done cooking. I’ve also mixed fresh parsley with bread crumb topping before with great success. And if it works on mac and cheese, it has to work here, right? While I was in Minnesota last week–oh wait! I can finally tell you about my little secret. I went to Minnesota last week to scout wedding venues! My parents were rock stars, keeping my annoying secret so that I could devote all my time to running around downtown St. Paul touring gorgeous mansions and historic buildings with massive fireplaces and decorative ceilings. I’m thrilled to announce that Steve and I are getting married November 7, 2015, at The University Club of St. Paul, smack in front of one of those historic fireplaces. Exciting, right? But actually, I was about to tell you not about my wedding venue, but of the gluten-free butternut squash mac and cheese I made for my parents while in the midwest. 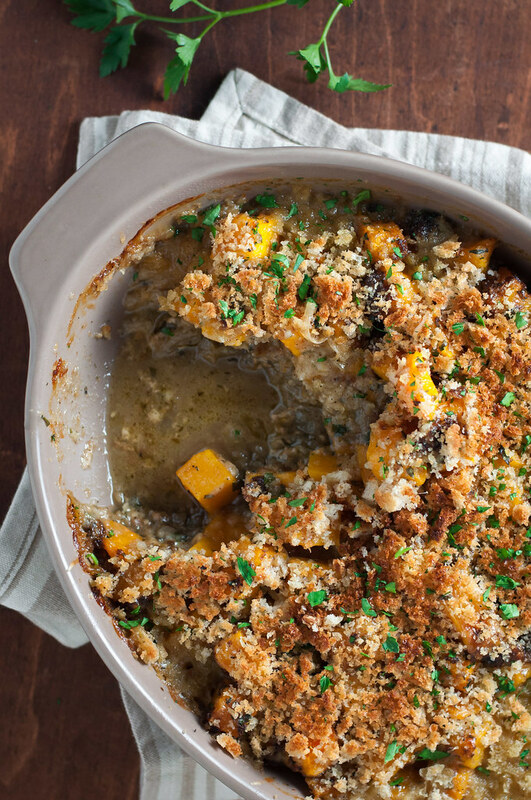 Because…more butternut squash! I’m so confused on my seasons. The mac uses frozen squash, so you can easily find it all year and don’t have to be afraid of what you might discover upon slicing into that out-of-season butternut squash that you paid through-the-roof for. I’m most proud of the pumpkin seed and parmesan topping I invented, which will cause you to miss bread crumbs not at all. 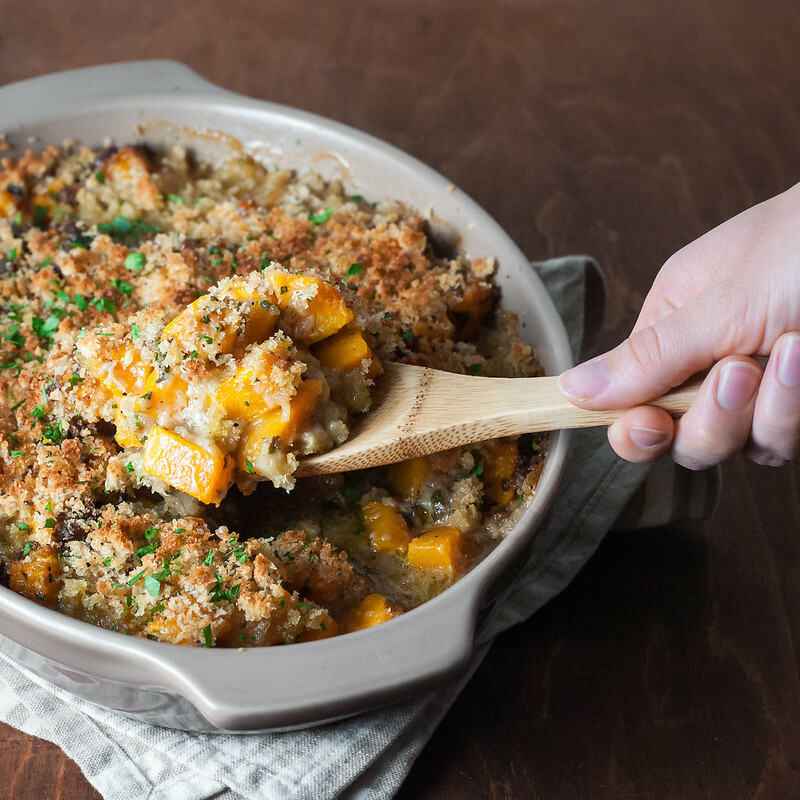 So go for the bread crumbs in this cheesy butternut squash gratin, then next week I’ll give you the gluten-free version, along with that glorious mac and cheese recipe. Deal? 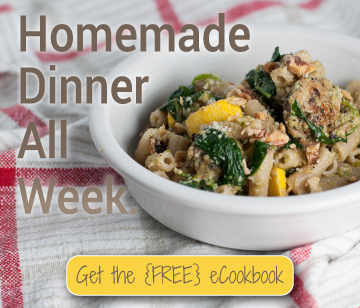 If you can't find butternut squash, try this with pumpkin, acorn squash, or another winter squash variety. It comes together rather quickly, then slowly bakes to bubbly, cheesy, crispy perfection. Lightly butter a 2 quart gratin or other baking dish. Heat 2 tablespoons of oil in a large skillet over medium heat, then add onions and dried herbs. Cook, stirring frequently and adjusting heat to maintain a moderate sizzle. After 15 minutes, when onions are darkened, reduced in volume, and become slightly jam-like, spread in bottom of prepared dish. In a large mixing bowl, toss squash with flour to coat. Heat 2 more tablespoons oil in the same skillet over medium, then add squash, after shaking off excess flour, and stir immediately to coat with oil. Cook, stirring often, 7 to 8 minutes, until just starting to brown. Add parsley and sprinkle liberally with salt and pepper, then cook one more minute. If lots of flour has stuck to the pan and browned, increase heat slightly, add a couple tablespoons of water, and scrape the bottom to deglaze the pan. Include browned bits and layer the squash over the onions. Sprinkle cheese over the vegetables, the pour milk evenly over everything. Cover and bake 25 minutes. Meanwhile, mix bread crumbs with a teaspoon or so of remaining olive oil and mix to combine well. Stir in a pinch of salt and pepper. After 25 minutes, uncover gratin, sprinkle evenly with breadcrumb mixture, and bake uncovered another 25 minutes. To brown the breadcrumbs as in the pictures, heat about 6 inches from the broiler for 2 to 3 minutes, watching carefully so it doesn't burn. Cool 5 to 10 minutes before serving. Adapted from The New Vegetarian Cooking for Everyone by Deborah Madison.